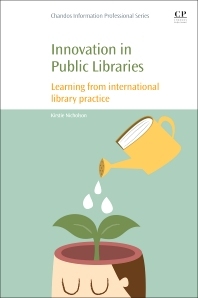 Innovation in Public Libraries: Learning from International Library Practice examines the recent activities of successful and innovative libraries around the world, presenting their initiatives in areas including library design, events and programs, and creating customer experiences. This timely guide provides an overview of these libraries’ successful experiences and identifies emerging global trends and themes. The author offers library practitioners guidance on how to pursue these trends in their own library environment, identifying achievable goals when planning building and design improvements, and developing customer interactions in order to emulate the experiences of international libraries. Kirstie Nicholson is Resources Librarian at the City of Armadale Library Service in Perth, Western Australia. In 2012, she was the inaugural winner of the Kay Poustie OAM Travel Scholarship, travelling to Europe and learning from innovative library services. She is Chair of the Online Resources Working Group which administers and manages the statewide electronic resources collection for Western Australian public libraries. Recently, she has been involved in the development of the Western Australia Public Libraries Digital Media Collection.